114 Bain Douche 2 in 1 is a superb range of body wash that both cleanses and moisturizes the skin. A favorite among women thanks to the presence of wheat proteins and glycerin guaranteed to soften and moisturize their delicate skin. 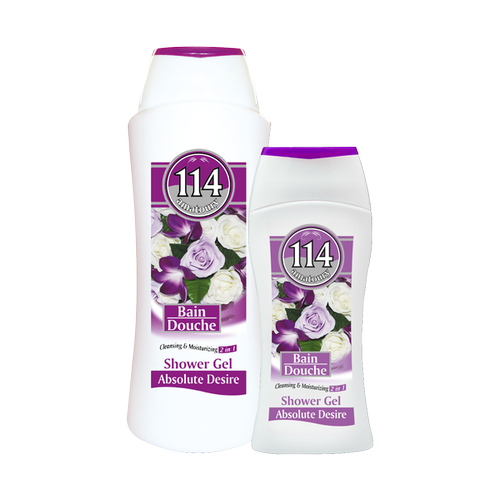 This 2 in 1 shower gel from Amatoury 114 is especially formulated for dry and sensitive skin. Enriched with natural emollients and free of parabens, the super-rich foam of this dual action shower gel will both cleanse and moisturize your body while wrapping it in the delicious scent of vanilla and coconuts for hours. Aqua, Sodium Laureth Sulfate, Lauryl Glucoside, Cocamidopropyl Betaïne, PEG-7 Glyceryl Cocoate, Cocamide DEA, Glycerin, PEG-3 Distearate, Disodium Cocoamphodiacetate, Perfume, Sodium Chloride, Divinyldimethicone/Dimethicone Copolymer, C1213- Pareth-23, C1213- Pareth-3, Polyquaternium-7, Guar Hydroxypropyltrimonium Chloride, Citric Acid, Methylchloroisothiazolinone, Methylisothiazolinone, Tetrasodium EDTA, Butylphenyl Methylpropional, Coumarin. 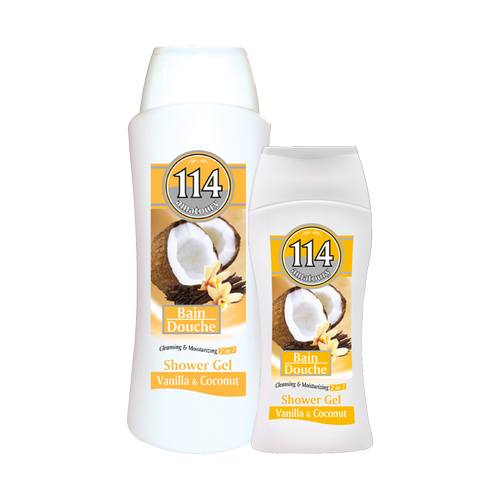 This 2 in 1 shower gel from Amatoury 114 is especially formulated for dry and sensitive skin. Enriched with natural emollients and free of parabens, the super-rich foam of this dual action shower gel will both cleanse and moisturize your body while wrapping it in the delicious scent of luxurious pink roses for hours. Aqua, Sodium Laureth Sulfate, Lauryl Glucoside, Cocamidopropyl Betaïne, PEG-7 Glyceryl Cocoate, Cocamide DEA, Glycerin, PEG-3 Distearate, Disodium Cocoamphodiacetate, Perfume, Sodium Chloride, Divinyldimethicone/Dimethicone Copolymer, C1213- Pareth-23, C1213- Pareth-3, Polyquaternium-7, Guar Hydroxypropyltrimonium Chloride, Citric Acid, Methylchloroisothiazolinone, Methylisothiazolinone, Tetrasodium EDTA, Limonene, Butylphenyl Methylpropional, Alpha-iso-methyl Ionone, Benzyl Salicylate, Hexyl Cinnamal, Linalool, Citronellol, Geraniol. 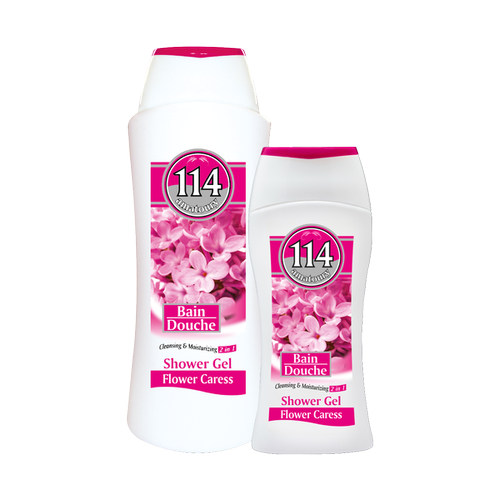 This 2 in 1 shower gel from Amatoury 114 is especially formulated for dry and sensitive skin. Enriched with natural emollients and free of parabens, the super-rich foam of this dual action shower gel will both cleanse and moisturize your body while wrapping it in the delicious scent of flowers for hours. Divinyldimethicone/Dimethicone Copolymer, C1213- Pareth-23, C1213- Pareth-3, Polyquaternium-7, Guar Hydroxypropyltrimonium Chloride, Citric Acid, Methylchloroisothiazolinone, Methylisothiazolinone, Tetrasodium EDTA, Hexyl Cinnamal, Hydroxycitronellal, Butylphenyl Methylpropional, Linalool, Limonene, BDFC250NP Citronellol. This 2 in 1 shower gel from Amatoury 114 is especially formulated for dry and sensitive skin. Enriched with natural emollients and free of parabens, the super-rich foam of this dual action shower gel will both cleanse and moisturize your body while wrapping it in the delicious scent of white roses and violets for hours.